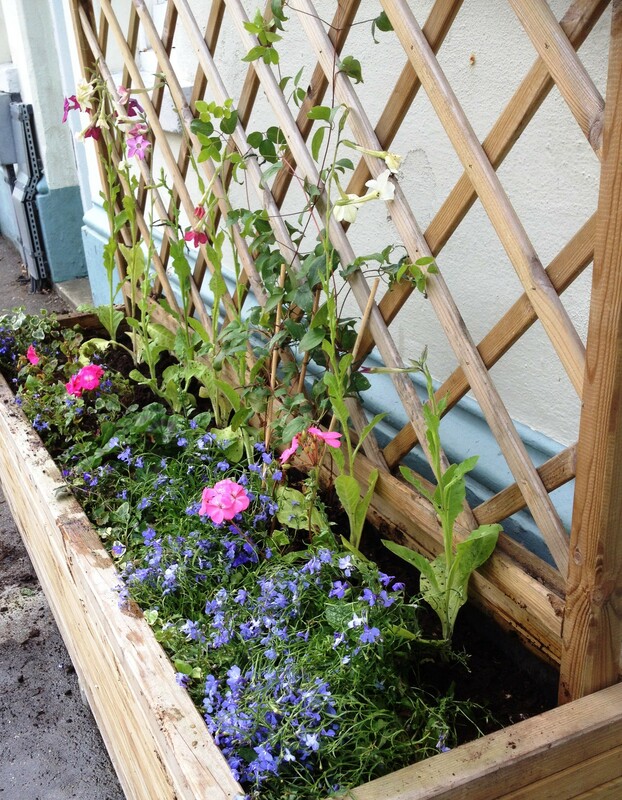 Though we tend to focus on our edible growing plot, we love our platform planters and the tree pits outside London Road Station. The platform planters are quite shady while the tree pits are in full sun, with young trees greedy for moisture: a challenge for planting on both scores. But what’s been chastening – putting us gardeners in our place – is just how joyfully wayward the plants in these areas seem to have been. First candidate for plant bloodymindedness: our foxgloves. Tolerant of shade, pretty robust and attractive to bees, these were supposed to be the showpiece of our platform planters last year. They did nothing but put on leaf and sulk, though inexplicably one decided to flower in November. 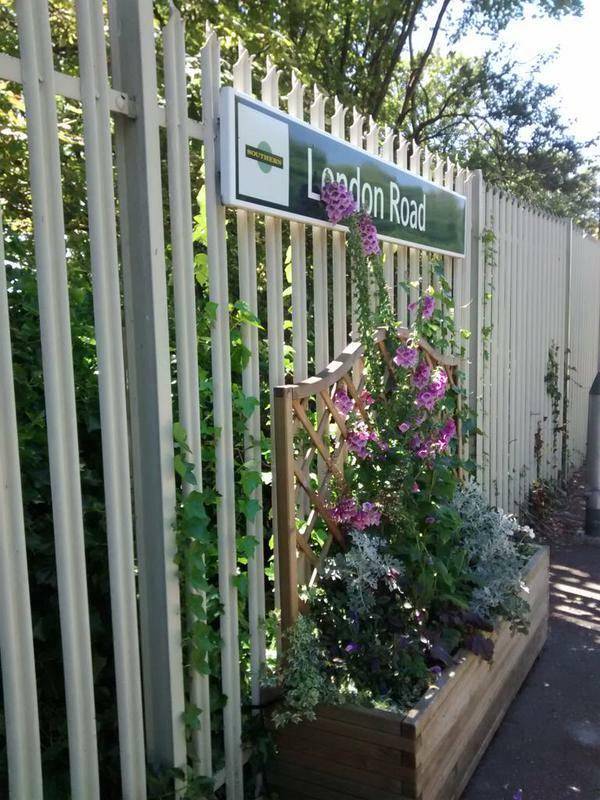 This year, though, they sprung up all ebullient with a lovely show of flowers, as in the photo above tweeted by @LondonRdLAT. We did think about trying to cut back their crazy spires and make them all neat and tidy, but the bees were clearly having a great time in the ‘gloves’, so we left them until all the flowers had disappeared. Philippa and I took them out last Thursday. We replaced them with nicotanias we had grown from seed and hope they’ll survive the strong winds. 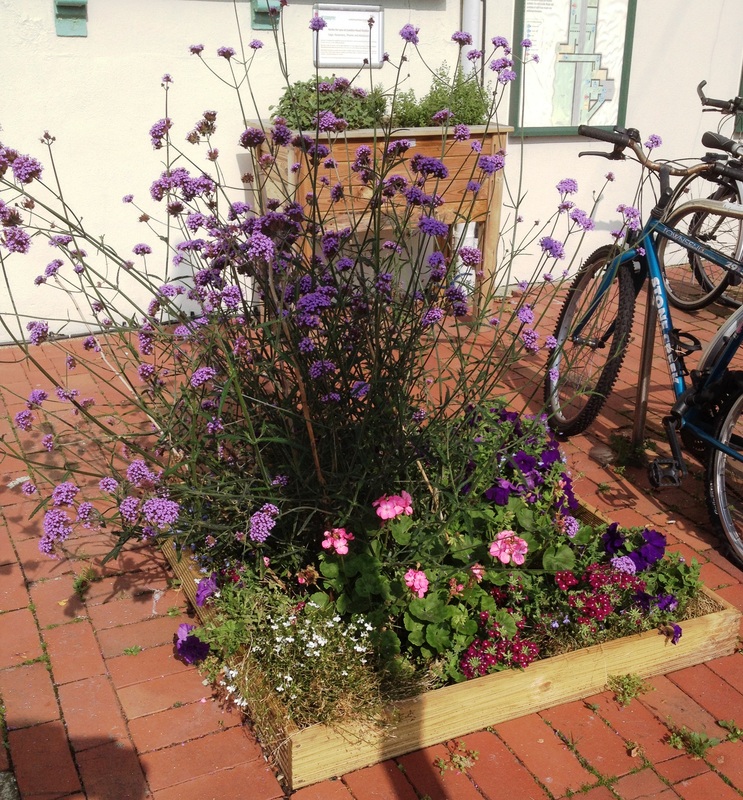 Next up are the verbena bonariensis in the tree pit on the right side of the station building in Shaftesbury Place. Last year, we planted a lot of verbena – they self-seed in my garden – and they performed beautifully, waving purple heads in the wind. have decided they like growing just outside the tree pit. You can see the line of strong plants just outside the wooden frame in the photo. We’ve left them to grow on, admiring their chutzpah. On Saturday, I teased out a few for taming and have potted them on. And just look at the colour of those poppies: strong blood red, not the usual orange-red or floaty pink . Neighbours have admired them and asked for seed. But we don’t really know where they came from. I know we’ve scattered odd packets of seed around the tree pits, including some poppy seed. What makes me smile is that had we deliberately set out to grow these poppies, they probably wouldn’t have taken half as well. We took them out last week as they had finished flowering, but shook the seed heads over the tree pits. We’ll see what happens next year. Finally, it’s a relief this summer not to be trying to water the four large black planters at Preston Circus. They’ve been ‘decluttered’ from Preston Circus but set to work on traffic calming in Viaduct Road. When I passed them back in June, I did however feel a certain nostalgia for the evenings of slopping watering cans from Calvary Church across to the islands in the middle of the streams of traffic. 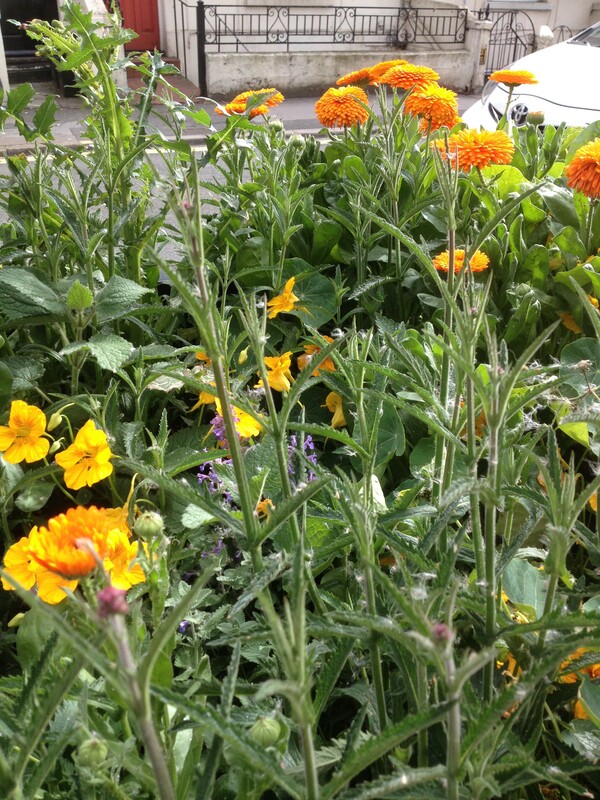 What was lovely to see was the amazing growth of colourful flowers in the planters: marigolds, nasturtiums and plenty of … verbena bonariensis. 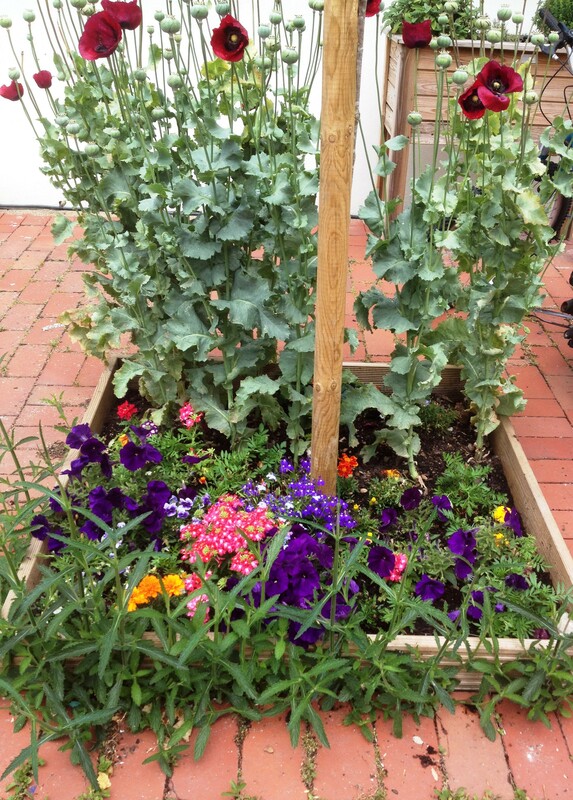 I’ve asked around: nobody is owning up to guerrilla gardening, so I can only conclude that the planters have done their own thing and self-seeded from the plants that grew there last year. Humbling and inspiring!